Say hello to my share of 812B--well, more like my closet and a few other random stuff. 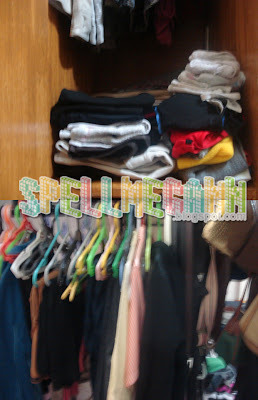 This was initially supposed to be a post on how I finally fixed my closet in the dorm, but really, I'd rather just post photographs for now since I don't have much time for the words I used to never seem to get enough of. Enter photos. 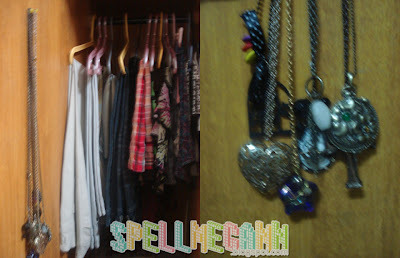 Right: About half of my collection of necklaces, hung at the back of the door of my closet. Top: More clothes at the next divisions of my closet. Left: (This is actually at the right side of the room) My roommate's side; "Naughty", post-it's, delivery menus, etc. Right: My side of the wall (actually at the left side of the room); "Nice", random papers, accessories, pictures, reminders, etc. ** The signs were made by me. I used these for one of our previous activities in the organization. Got to keep it after the activity. Haha loved it! On a Tuesday night, I spent hours diving eyes into these pages and pages of photocopied readings. Studying for FOTOCOM--never thought it would be this hard! But the late night bedtime was well worth it. I hope I pass the test!